Charles D. Dziuban is Director of the Research Initiative for Teaching Effectiveness, Center for Distributed Learning, at the University of Central Florida, USA. Anthony G. Picciano is Professor and Executive Officer of the Ph.D. Program in Urban Education at the Graduate Center of the City University of New York, USA. Charles R. Graham is Professor of Instructional Psychology and Technology at Brigham Young University, USA. He currently serves as Department Chair. Patsy D. Moskal is the Associate Director for the Research Initiative for Teaching Effectiveness, Center for Distributed Learning, at the University of Central Florida, USA. 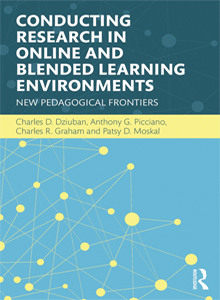 Conducting Research in Online and Blended Learning Environments examines various perspectives, issues, and methods for conducting research in online and blended learning environments. The book provides in-depth examinations of the perspectives and issues that anyone considering research in online or blended learning will find insightful as they plan their own inquiries. Grounded in educational research theory, this is invaluable to both the serious researcher as well as the occasional evaluator. Conducting Research in Online and Blended Learning Environments provides comprehensive, useful information on research paradigms, methodologies, and methods that should be considered in designing and conducting studies in this area. Examples of the most respected research in the field enhance each chapter’s presentation. Chapter 13: What the Future Might Hold for Online and Blended Learning Research?